“Anne Marie, Mary, David, Christine, Victor and Jennifer waited for the End Café to open at 9 AM. When our instructor, Ahmad, showed up, we were directed to a private corner with a large window facing Commercial Drive. We all introduced ourselves and explained our needs for understanding navigation better. Anne Marie felt she wanted to be able to navigate through a white out. Mary was unsure about which way to correct for declination. Introductions over, our teacher spread out an array of topographical maps (for more, see ‘topography’ on Wikipedia). There were many numerals involved, challenging for the math phobics! We examined scales/ratios, elevation intervals/contours, slopes & grades and shading & colour. We tried to envision contour lines as landforms – peaks, cliffs, ridges, gullies and saddles. We all tested our understanding by translating the formations on our Seymour map into a 3 dimensional drawing. Artists we were not! Next the group produced an assortment of compasses – borrowed, faded housings, brand new, squeaky housing. We learned the nomenclature: orienteering arrow, meridian lines, index line. (Again, look up ‘compass’ in Wikipedia for interesting facts.) Using our instrument we took bearings on various features around us; the trees and posts on the street and even a chair in the café. This was not as easy as it seems. There was a great deal of variations in our measurements, some due metal materials around us affecting the magnetic arrow and some error due to inexperience in holding the compass and sighting. We followed up by applying our knowledge to the map that Ahmad supplied. Before setting off into the wilds one can make directional notes and then it is quicker and easier to move along. This preparation is useful when there are no amenities outside like a flat working surface or good cover from the elements. Noon passed and finally we set off for the North Shore. At the park we donned snowshoes and sunglasses. Before moving we took note of Dinky Peak in front of us (a local prominence and aptly named). We progressed slowly, stopping and starting along the trail to Dog Mt. As we were standing around measuring, computing and drawing intersecting lines, we got some attention and gentle ribbing from some day hikers: Lost? Treasure hunting? 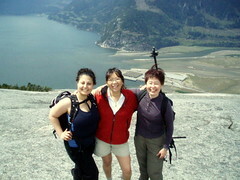 Finally rest, snacks & socializing with a vista of the lower mainland from our peak. At the saddle below the high point, Ahmad felt his little band were fit and confident enough to head away from the beaten track. We climbed up and followed a ridge to Suicide Bluffs, staying well away from the 45 degree slope. We took bearings at various checkpoints. Our destination was the North Shore Search and Rescue cabin that we had spotted earlier. We did get there using a combination of careful observations of the surrounding features, and following some old snowshoe tracks up a steep slope! Homeward bound, we headed the shortest and easiest route to our cars arriving just after 6 pm.